Governor Kempthorne presented his last state of the state and budget to the legislature and the public on Monday night, January 9. In this first column I'm going to list some of his initiatives and my concerns for your consideration. Public employee pay raises: He stepped up to the plate and said we should give raises immediately in this fiscal year. He wants to add 3% to the base. A 1% raise was authorized last session based on revenues which far exceeded expectations. Our state employees are far under the market rate of their private economy counterparts, on an average of 16%. I support this and hope for more. Public schools: He recommended raising the starting pay for teachers to $30,000, but offered only a 2.2 to 2.5% raise to everyone else. I think the public school employees should get the same raises as the public employees. Property taxes: He suggested a higher qualifying net income for the circuit breaker program, a property tax relief program for low income seniors and the disabled, $30,000, but kept the benefit payment at $1200. This is too low for our communities who have escalating values. I think $28,000 with a $1320 maximum benefit is better. He also offered a deferred property tax program. He failed to lead on state required property tax initiatives such as raising the homeowner's exemption and the repeal of the developer discount agriculture/development statute that has cost counties valuable revenue and shifted the cost of services to other tax payers. I will be working in the House Revenue and Taxation Committee for property tax solutions. School Buildings: He suggested that we lower the super majority vote approval for school buildings to 60% with the votes on the primary or general election days. This will need a 2/3 vote by the House and Senate to go on the ballot for a constitutional change and is in response to the Supreme Court telling the legislature to help fund a safe learning environment for Idaho's children. He said we should increase funds to the interest subsidy program that Wendell and 23 other districts have used to build a new schools but with 114 districts with who knows how many unsafe schools, this could take forever. I will work to get the Interim Property Tax Committee's recommendation to require impact fees for new schools passed. "Make Growth Pay for Itself", said the people who testified in the hearings before the committee this summer. Community Colleges: He addressed the issue of a more integrated community college throughout the state by suggesting that classes taught by adjunct professors (part time) could be presented in community libraries, county buildings, k-12 schools at a cheaper cost which is a creative and good idea. However, he didn't offer how we can create equity in this community college system which is partially funded by property tax payers in Jerome, Twin Falls and Kootenai counties, but not in other counties such as Ada and Canyon who really need a community college. Governor's Mansion: He suggested that the state purchase additional acreage below the "donated" Simplot home which is to be the Governor's mansion. At $2 million dollars, it seems like the Simplots should sell that land to a developer and the mansion be in a neighborhood. The $2 million dollars needs to go to schools in areas where there are low property values and the interest subsidy won't help enough. Experiencing Idaho: He suggested that we fund a new park in Eastern Idaho and improve a few parks around the state including Billingsley. I want to help the Hagerman site, but I'm worried about spending money on improvements when most parks need an infusion of cash just to take care of needed maintenance. I'm concerned about last year's Connecting Idaho, the highway construction initiative that is effecting scheduled highway improvements like the highway between Shoshone and Timmerman. I'm not sure we can afford a new initiative. Energy Assistance: The Governor wants to send everyone $50 to offset their power bills this winter. I would rather see the money go to families who qualify through the Community Action Agency energy assistance programs around the state. They already have a system in place. It would cost the state $400,000 to send out those $50 checks. Does everyone need this? Lots of ideas to think about. If you have suggestions/different ideas, please contact me at 800/ 626-0471 or wjaquet@house.idaho.gov I appreciate hearing from you. Have a good week. 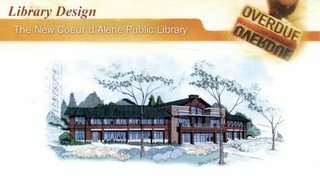 COEUR d'ALENE -- Overdue fees won't cover the $1.4 million needed to build a new downtown library. The city of Coeur d'Alene is committed to building a $7.2 million facility -- even if all the money isn't in place when construction is scheduled to start in May. "We're determined to get this rolling because the longer we wait, the more the cost goes up," Councilwoman Deanna Goodlander said Wednesday. I've always found this annual survey of Idaho opinion on public policy done by Boise State University's Social Science Research Center to be thorough and well done. Occasionally I may quibble with the wording of a question (which means everything in a survey like this) but I think this year's results are instructive. Jim Weatherby, who has a lot of involvement in this survey, is a keen observer of Idaho's public policy. Property taxes may be a major issue in high-growth areas like Coeur d'Alene and Kootenai County. But they don't seem to be trumping everything else, which doesn't bode well for reform and relief for places that need help from the legislature to modify how they assess needed impact fees for new development. No pressure on Southern Idaho legislative leaders means little change. The Governor showed that he doesn't care too much about property tax relief in last night's State of the State and Budget Addresses. Let's hope this year's legislature spends more time on important economic and educational public policy issues than they do on far less important social issues put up simply to be divisive and political. Mike Kennedy, right, is joined by his family as he receives his certificate after being sworn in as the newest member of the Coeur d'Alene City Council on Tuesday. Family from left, Will, Maggie, Nora, wife Kathleen, Quinn, and Max. "COEUR d'ALENE -- Tuesday's City Council meeting had very little on the agenda except for some very big changes. Ben Wolfinger said goodbye, accepted some parting gifts, and welcomed his replacement, Mike Kennedy. 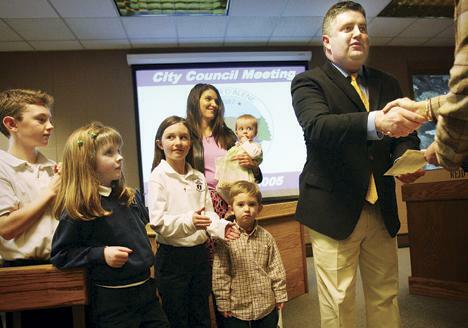 "It has been a very fast five years," Wolfinger said. "It's been a wonderful experience. Mike's going to do a great job, and I am glad to be a resident."